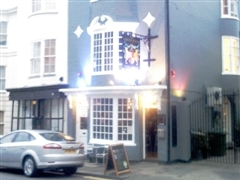 The Grosvenor Bar, Brighton & Hove, BN1 2PG. The Grosvenor Bar pub review, map and rating. Looking for a Hotel near The Grosvenor Bar? This small friendly bar is now under new ownership,both inside and out has undergone major works and looks fantastic.There is Karaoke every Friday and Cabaret every Saturday. Looked this pub up on Google because it's at the centre of a novel called "Breakfast in Brighton" which was lovely to read as I am an old Brightonian exciled in Norfolk! Stumbled across this little secret last Thursday and popped in for a quick one on way to gig. Ended up staying for a couple more as it was so friendly and the place had a nice feel about it. Will be back soon.